At about this time, the arrival of workers from Scotland, the north of England, and eastern and central Europe was at its height. Some brought with them their families, and the younger unmarried began to marry and have children. The story of one man, the late Ivan Novak from Croatia, caught up in the turmoil of the war's end, who came to Nuneaton and joined the parish in its early days may be read here on the BBC website. Camp Hill, a very large housing development built by the National Coal Board and now an area undergoing massive regeneration, was constructed in the 1950s and 60s. Hartshill and Ansley Common nearby grew too. In response to this growth St Anne's became a parish of its own in 1952 and Fr Patrick Meagher came as priest in charge. Soon afterwards, St Joseph’s Church, New Arley came into the parish. "We came to Camphill Grange on 1st January 1948. Mass was then said in the disused fever hospital at the top of Camphill Road by a priest from Our Lady’s parish. Father Cox was our parish priest there. The first parishioners we met there were the Kearns and Deeming families. A few months later work was started on building St Anne’s Church. There was a fund for buying ‘Granny bricks’ after St Anne (granny of our Lord). There was a great influx of Catholics from Eastern Europe after the war; also from NE England due to mine closures. When we had our own priest we gave a plot of land next to our house to build the presbytery. Father Meagher was the first resident parish priest. He had a house-keeper called Maggie – a lovely person. Many tales can be told about her. I was on the flower rota for over 50 years. When we were doing them on a cold day Maggie would appear with cups of hot coffee, with brandy in them. On another occasion I was at Benediction and raised my eyes in horror to see our St Bernard just about to touch the kneeling, unsuspecting priest. Like a shot, Maggie was up the aisle and rescued him. The church was opened by the Archbishop of Birmingham, Joseph Masterson (1947-1953).Father Cox asked us to give the Bishop breakfast after Mass and then he met some of the parishioners, for sherry, in the sitting room. A little school was started in the church with one teacher. Our daughter Helen was a pupil there. May processions were held. We all processed, singing hymns, from the church, up our drive and into the garden. Once we had a young priest from USA, to preach. This was Father O’Carroll. He had to return to the UK later to look after his sick mother. Later he became parish priest at St Anne’s for many years. On hot evenings the parishioners would bring out chairs and we would have Mass in the garden by Our Lady’s Grotto. Redemptorist priests gave us some missions. One stayed in the presbytery and the other with us. They said Masses, visited parishioners and there were evening services with confession. Later during Father Loftus’ time there was a mission and he had no housekeeper. Marie Deeming and I shared duties of cooking and cleaning the house. I remember saying to Father Provett ( a lovely Liverpudlian) that I did not know what to leave for their evening meal. He suggested ‘jam butties’ and I didn’t know what he meant. St Anne’s school was opened in 1968. The first governors were: Father Loftus, George Goodwin, Marie Deeming and Gerry Beauchamp. Mr Bullen was headmaster. Harry was a pupil for one term and John started in Reception (his teacher was the talented Sylvia Rochford RIP). John went through St. Anne’s and then St. Joseph’s. Later Noreen taught there for many years and followed the late Marie Doyle, who died suddenly in Ireland, as head. St Anne’s Church has been a very important place for our family. Most of our children were baptised and confirmed there and four daughters were married there. Gerry was often asking Fr. Michael if the church would be finished in time for his funeral. In the event it was. We were actively involved in most parish activities. Apart from the land for the presbytery, we gave some furniture. Also the paten which was in memory of Celia Sheridan (she died aged 5 years). A lot of us bought the old large Stations of the Cross think I there is still an old metal crucifix in the confessional (it originally came from a convent)". Arley had been part of the parish of Bedworth, and in the 1920s Canon Wall began to say Mass in various houses in the village. By the mid-1920s, coal mining was attracting an influx of workers to Arley (many from the north of England) and the village grew. A site was acquired and, with the help and support of the community, a wooden church was built and in the summer of 1926 a procession from Arley Cricket ground to St Joseph’s marked the opening of the new church. By 1928, a congregation of two dozen was normal. During the height of the Second World War, the church was used less and parishioners attended Mass at Nuneaton or Bedworth. After the war, things picked up and a succession of curates from Nuneaton and Bedworth took care of the Catholic community. At that time, St Joseph’s had a hall which became a centre of social activity. 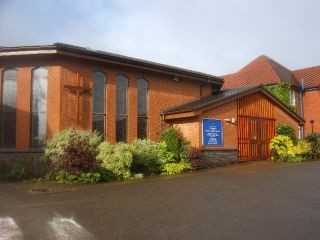 In 1959, responsibility for St Joseph’s and the surrounding area was transferred from the parish of Bedworth to the parish of St Anne, Chapel End. Over the years, this parish with its two churches expanded, the parish school was founded and a worshipping community was cared for by a succession of parish priests. When Fr Michael Stack arrived in 1993, it was becoming clear that the church buildings of the parish were going to need a great deal of work. St Joseph’s, a wooden structure, had served well for seventy years but was no longer a sound and solid building. St Anne’s, put up originally as a temporary building in difficult times immediately after the war, was becoming very tired. The original St Anne’s Church was a much loved building that had served as a schoolroom too. The time had come to replace it. After much planning work began on rebuilding, which was announced in the local press (view here). The presbytery became the weekday church building and Sunday Masses were celebrated in the school hall. On 11th March 2000—the Jubilee Year—the foundation stone was blessed by Bishop Philip Pargeter, in the presence of hundreds of parishioners and guests, with music provided by children of the school. Fr Michael Stack, the parish priest, achieved the rare distinction of building two churches. The building was ready for use a little while later, and was blessed by Archbishop Vincent Nichols during a Mass on 11th November, 2000. It was a day of much rejoicing, and the end of years of planning and construction work in the parish. Fr Stephen Day arrived in the parish in August 2001. Since then at St Anne's we have installed more stained glass, finished the car park and improved the hall. We celebrated ten years of the new building in 2010 with a Flower Festival and then with BIshop Pargeter blessing the stained glass windows in November. In the summer of 2011 we celebrated the ordination to the diaconate of Michael Glover. Ordained at Oscott on 25th June (pictures here), Michael came back to the parish for the weekend and a few days more to exercise his new ministry until other commitments - not least to study - called him away. Fr Michael was ordained to the priesthood on 14th July 2012 at our Lady of the Angels Church, Nuneaton and he celebrated his first Mass here at St Anne's the next day. (Pictures may be seen in the galleries section of this website). It was a wonderful weekend of celebration for the Catholic community of Nuneaton. In November 2014 it was announced that Fr Day was to move to St Thomas More, Stivichall in Coventry, and that Fr Simon Stephens (of St Mary's, Norton-le-Moors, Staffordshire) is to be the next parish priest. He arrived in late January 2015 and was inducted in July.